This article is about the city. For other uses, see Aleppo (disambiguation). 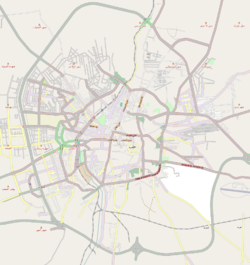 Aleppo (/əˈlɛpoʊ/; Arabic: ﺣَﻠَﺐ‎ / ALA-LC: Ḥalab, IPA: [ˈħalab]) is a city in Syria, serving as the capital of the Aleppo Governorate, the most populous Syrian governorate. With an official population of 4.6 million in 2010, Aleppo was the largest Syrian city before the Syrian Civil War; however, now Aleppo is probably the second-largest city in Syria after the capital Damascus. Aleppo is one of the oldest continuously inhabited cities in the world; it may have been inhabited since the 6th millennium BC. Excavations at Tell as-Sawda and Tell al-Ansari, just south of the old city of Aleppo, show that the area was occupied by Amorites since at least the latter part of the 3rd millennium BC. This is also when Aleppo is first mentioned in cuneiform tablets unearthed in Ebla and Mesopotamia, in which it is a part of the Amorite state of Yamhad, and is noted for its commercial and military proficiency. Such a long history is attributed to its strategic location as a trading center midway between the Mediterranean Sea and Mesopotamia (i.e. modern Iraq). For centuries, Aleppo was the largest city in the Syrian region, and the Ottoman Empire's third-largest after Constantinople and Cairo. The city's significance in history has been its location at one end of the Silk Road, which passed through central Asia and Mesopotamia. When the Suez Canal was inaugurated in 1869, trade was diverted to sea and Aleppo began its slow decline. At the fall of the Ottoman Empire after World War I, Aleppo ceded its northern hinterland to modern Turkey, as well as the important railway connecting it to Mosul. In the 1940s, it lost its main access to the sea, Antakya and İskenderun, also to Turkey. Finally, the isolation of Syria in the past few decades further exacerbated the situation. This decline may have helped to preserve the old city of Aleppo, its medieval architecture and traditional heritage. It won the title of the "Islamic Capital of Culture 2006", and has had a wave of successful restorations of its historic landmarks. The Battle of Aleppo (2012–2016) occurred in the city during the Syrian Civil War, and many parts of the city suffered massive destruction. Affected parts of the city are currently undergoing reconstruction. The original ancient name, Halab, has survived as the current Arabic name of the city. It is of obscure origin. However, the term Ḥalab might be derived from (Hebrew: חלב‎, lit. 'milk') related to a folktale of Abraham, who milked his sheep to feed the poor. Others have proposed that Ḥalab means "iron" or "copper" in Amorite languages, since the area served as a major source of these metals in antiquity. Another possibility is that Ḥalab means 'white', as this is the word for 'white' in Aramaic, the local language which preceded regional Arabization. 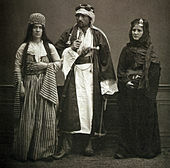 This may explain how Ḥalab became the Hebrew word for milk or vice versa, as well as offers a possible explanation for the modern-day Arabic nickname of the city, ash-Shahbaa (Arabic: الشهباء‎), which means "the white-colored mixed with black" and allegedly derives from the famous white marble of Aleppo. 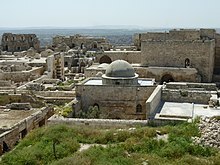 Also Abraham is said to have camped on the acropolis which, long before his time, served as the foundation of a fortress where the Aleppo citadel is standing now. He milked his grey cow there, hence Aleppo's name "Halab Al-Shahba". Aleppo appears in historical records as an important city much earlier than Damascus. The first record of Aleppo comes from the third millennium BC, in the Ebla tablets when Aleppo was referred to as Ha-lam (𒄩𒇴). Some historians, such as Wayne Horowitz, identify Aleppo with the capital of an independent kingdom closely related to Ebla, known as Armi, although this identification is contested. The main temple of the storm god Hadad was located on the citadel hill in the center of the city, when the city was known as the city of Hadad. Taking advantage of the power vacuum in the region, Parshatatar, king of the Hurrian kingdom of Mitanni instigated a rebellion that ended the life of Yamhad last king Ilim-Ilimma I in c. 1525 BC, Subsequently, Parshatatar conquered Aleppo and the city found itself on the frontline in the struggle between the Mitanni, the Hittites and Egypt. Niqmepa of Alalakh who descends from the old Yamhadite kings controlled the city as a vassal to Mitanni and was attacked by Tudhaliya I of the Hittites as a retaliation for his alliance to Mitanni. Later the Hittite king Suppiluliumas I permanently defeated Mitanni and conquered Aleppo in the 14th century BC, Suppiluliumas installed his son Telepinus as king and a dynasty of Suppiluliumas descendants ruled Aleppo until the Late Bronze Age collapse. 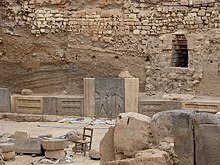 In 2003, a statue of a king named Taita bearing inscriptions in Luwian was discovered during excavations conducted by German archeologist Kay Kohlmeyer in the Citadel of Aleppo. The new readings of Anatolian hieroglyphic signs proposed by the Hittitologists Elisabeth Rieken and Ilya Yakubovich were conducive to the conclusion that the country ruled by Taita was called Palistin. This country extended in the 11th-10th centuries BCE from the Amouq Valley in the west to Aleppo in the east down to Mehardeh and Shaizar in the south. Due to the similarity between Palistin and Philistines, Hittitologist John David Hawkins (who translated the Aleppo inscriptions) hypothesizes a connection between the Syro-Hittite Palistin and the Philistines, as do archaeologists Benjamin Sass and Kay Kohlmeyer. Gershon Galil suggests that King David halted the Arameans’ expansion into the Land of Israel on account of his alliance with the southern Philistine kings, as well as with Toi, king of Ḥamath, who is identified with Tai(ta) II, king of Palistin (the northern Sea Peoples). At some point in the beginning of the 1st millennium BC, Aleppo became part of the Aramean state of Bit Agusi (which had its capital at Arpad). Bit Agusi along with Aleppo was conquered by the Assyrians In the 8th century BC and became part of the Neo-Assyrian Empire until the late 7th century BC, before passing through the hands of the Neo-Babylonians and the Achamenid Persians. Beroea is mentioned in 1 Macc. 9:4. In 1128 Aleppo became capital of the expanding Zengid dynasty, which ultimately conquered Damascus in 1154. In 1183 Aleppo came under the control of Saladin and then the Ayyubid Dynasty. 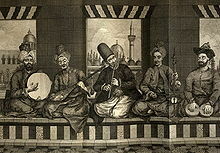 When the Ayyubids were toppled in Egypt by the Mamluks, the Ayyubid emir of Aleppo An-Nasir Yusuf became sultan of the remaining part of the Ayyubid Empire. He ruled Syria from his seat in Aleppo until, on 24 January 1260, the city was taken by the Mongols under Hulagu in alliance with their vassals the Frank knights of the ruler of Antioch Bohemond VI and his father-in-law the Armenian ruler Hetoum I. The city was poorly defended by Turanshah, and as a result the walls fell after six days of siege, and the citadel fell four weeks later. The Muslim population was massacred and many Jews were also killed. The Christian population was spared. Turanshah was shown unusual respect by the Mongols, and was allowed to live because of his age and bravery. The city was then given to the former Emir of Homs, al-Ashraf, and a Mongol garrison was established in the city. Some of the spoils were also given to Hethoum I for his assistance in the attack. The Mongol Army then continued on to Damascus, which surrendered, and the Mongols entered the city on 1 March 1260. In 1400, the Mongol-Turkic leader Tamerlane captured the city again from the Mamluks. He massacred many of the inhabitants, ordering the building of a tower of 20,000 skulls outside the city. After the withdrawal of the Mongols, all the Muslim population returned to Aleppo. On the other hand, Christians who left the city during the Mongol invasion, were unable to resettle back in their own quarter in the old town, a fact that led them to establish a new neighbourhood in 1420, built at the northern suburbs of Aleppo outside the city walls, to become known as al-Jdeydeh quarter ("new district" Arabic: جديدة‎). On 12 August 2011, some months after protests had begun elsewhere in Syria, anti-government protests were held in several districts of Aleppo, including the city's Sakhour district. At least two protesters had been shot dead by security forces during a demonstration in Sakhour with tens of thousands attendees. Two months later a pro-government demonstration was held in Saadallah Al-Jabiri Square. 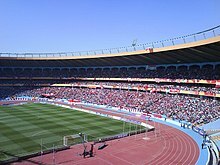 According to the New York Times, the 11 October 2011 rally in support of president Bashar al-Assad was attended by large crowds, while state and local media claimed more than 1.5 million attended and that it was one of the largest rallies ever held in Syria. In early 2012, security forces began to be targeted with bombings. On 10 February 2012, suicide car bombs exploded outside two security compounds – the Military Intelligence Directorate's local headquarters, and a Security Preservation forces barracks – reportedly killing 28 (four civilians, thirteen military personnel and eleven security personnel) and wounding 235. On 18 March 2012, another car bomb blast in a residential neighbourhood reportedly killed two security personnel and one female civilian, and wounded 30 residents. As a result of the severe battle, many sections in Al-Madina Souq (part of the Old City of Aleppo World Heritage Site), including parts of the Great Mosque of Aleppo and other medieval buildings in the ancient city, were destroyed and ruined or burnt in late summer 2012 as the armed groups of the Free Syrian Army and the Syrian Arab Army fought for control of the city. In March 2013, the Syrian Foreign Ministry claimed that some 1,000 factories in Aleppo have been plundered, and their stolen goods transferred to Turkey with the full knowledge and facilitation of the Turkish government. A stalemate that had been in place for four years ended in July 2016, when Syrian government troops closed the last supply line of the armed opposition into Aleppo with the support of Russian airstrikes. In response, rebel forces launched unsuccessful counteroffensives in September and October that failed to break the siege; in November, government forces embarked on a decisive campaign. The rebels agreed to evacuate from their remaining areas in December 2016. The Syrian government victory was widely seen as a potential turning point in Syria's civil war. On 22 December, the evacuation was completed with the Syrian Army declaring it had taken complete control of the city. Red Cross later confirmed that the evacuation of all civilians and rebels was complete. When the battle ended, 500,000 refugees and internally displaced persons returned to Aleppo, and hundreds of factories returned to production as electricity supply greatly increased. The citadel of Aleppo is now undergoing major repairs. Many parts of the city that were affected are undergoing reconstruction. On 15 April 2017, a convoy of buses carrying evacuees was attacked by a suicide bomber in Aleppo, killing more than 126 people, including at least 80 children. The Aleppo shopping festival took place on 17 November 2017 to promote industry in the city. A YPG commander stated in February 2018 that Kurdish fighters had shifted to Afrin to help repel the Turkish assault. As a result, he said the pro-Syrian government forces had regained control of the districts previously controlled by them. Aleppo has a cool steppe climate (Köppen: BSk). The mountain series that run along the Mediterranean coast, namely the Alawiyin Mountains and the Nur Mountains, largely block the effects of the Mediterranean on climate (rain shadow effect). The average high and low temperature throughout the year is 23.8 and 11.1 °C (74.8 and 52.0 °F). The average precipitation is 329.4 mm (12.97 in). More than 80% of precipitation occurs between October and March. It snows once or twice every winter. Average humidity is 55.7%. Aleppo Citadel, the roof of the baths, with the mosque and minaret in the background. Aleppo's large Christian population swelled with the influx of Armenian and Assyrian Christian refugees during the early 20th-century and after the Armenian and Assyrian genocides of 1915. After the arrival of the first groups of Armenian refugees (1915–1922) the population of Aleppo in 1922 counted 156,748 of which Muslims were 97,600 (62.26%), native Christians -mostly Catholics- 22,117 (14.11%), Jews 6,580 (4.20%), Europeans 2,652 (1.70%), Armenian refugees 20,007 (12.76%) and others 7,792 (4.97%). However, even though a large majority of the Armenians arrived during the period, the city has had an Armenian community since at least the 1100s, when a considerable number of Armenian families and merchants from the Armenian Kingdom of Cilicia settled in the city. The oldest Armenian church in the city is from 1491 as well, which indicates that they have been here long before. Aleppo was the most populous city in Syria, with a population of 2,132,100 as indicated in the latest official census in 2004 by the Syria Central Bureau of Statistics (CBS). Its subdistrict (nahiya) consisted of 23 localities with a collective population of 2,181,061 in 2004. According to the official estimate announced by the Aleppo City Council, the population of the city was 2,301,570 by the end of 2005. As a result of the Syrian Civil War, however, the city eastern half's population under the control of the opposition had plummeted to an estimated 40,000 by 2015. More than 80% of Aleppo's inhabitants are Sunni Muslims. They are mainly Arabs, followed by Turkmens and Kurds. Other Muslim groups include small numbers of ethnic Circassians, Chechens, Albanians, Bosniaks, Greeks and Bulgarians. 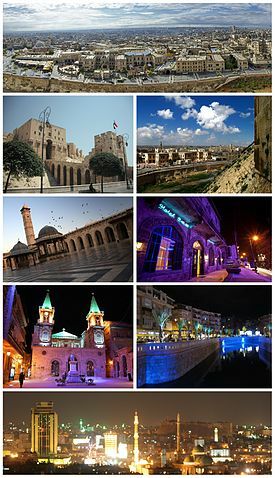 Until the breakup of the Battle of Aleppo in 2012 within the frames of the Syrian Civil War, the city contained one of the largest Christian communities in the Middle East, with many Oriental Orthodox Christian congregations, mainly Armenians and Assyrians (locally known as Syriacs). Historically, the city was the main centre of French Catholic missionaries in Syria. The Christian population of Aleppo was slightly more than 250,000 before the civil war, representing about 12% of the total population of the city. However, as a consequence of the Syrian Civil War, the Christian population of the city decreased to less than 100,000 as of the beginning of 2017, of whom around 30% are ethnic Armenians. Several districts of the city have a Christian and Armenian majority, such as the old Christian quarter of al-Jdayde. Around 50 churches operate in the city operated by the above-mentioned congregations. 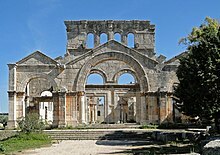 However, according to the Deputy Chairman of the Commission for UNESCO of the Russian Federation Alexander Dzasokhov, around 20 churches suffered great destruction during the battles in Aleppo, with the most notable being the National Evangelical Church, as well as the surrounding historic churches of al-Jdayde district. On December 25, 2016, following the government victory, Christmas was publicly celebrated in Aleppo for the first time in four years. The Arabic dialect of Aleppo is a type of Syrian Arabic, which is of the North Levantine Arabic variety. Many of its vocabularies are derived from the Syriac language. The Kurdish language is the second most spoken language in the city, after Arabic. Kurds in Aleppo speak the Northern Kurdish (also known as Kurmanji). Syrian Turkmen population of Aleppo speak the Kilis and Antep dialect of the Turkish language. Most Armenians speak the Western form of the Armenian language. Syriac language is rarely spoken by the Syriac community during daily life, but commonly used as the liturgical language of the Syriac Church. The members of the small Greco-Syrian community in Aleppo speak Arabic, but the Koine Greek dialect of the Greek language is used during church service by the Orthodox and Catholic Greek churches of Antioch. Al-Adeyat Archaeological Society founded in 1924 in Aleppo, is a cultural and social organization to preserve the tangible and intangible heritage of Aleppo and Syria in general. The society has branches in other governorates as well. The Blue Lagoon water park -heavily damaged during the battles- was one of the favourite places among the locals, as it was the first water park in Syria. Aleppo's Shahba Mall -one of the largest shopping centres in Syria- was also among the most visited locations for the locals. It has received major damages during the civil war. Aleppo's western suburbs are home to a group of historical sites and villages which are commonly known as the Dead Cities. 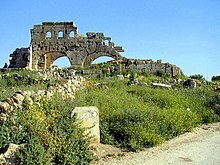 Around 700 abandoned settlements in the northwestern parts of Syria before the 5th century, contain remains of Christian Byzantine architecture. Many hundreds of those settlements are in Mount Simeon (Jabal Semaan) and Jabal Halaqa regions at the western suburbs of Aleppo, within the range of Limestone Massif. Dead Cities were inscribed as a UNESCO World Heritage Site in 2011, under the name of "Ancient Villages of Northern Syria". The main role of the city was as a trading place throughout the history, as it sat at the crossroads of two trade routes and mediated the trade from India, the Tigris and Euphrates regions and the route coming from Damascus in the South, which traced the base of the mountains rather than the rugged seacoast. Although trade was often directed away from the city for political reasons[why? ], it continued to thrive until the Europeans began to use the Cape route to India and later to utilize the route through Egypt to the Red Sea. In the 2000s, Aleppo was one of the fastest-growing cities in Syria and the Middle East. Many villagers and inhabitants of other Syrian districts are migrating to Aleppo in an effort to find better job opportunities, a fact that always increases population pressure, with a growing demand for new residential capacity. New districts and residential communities have been built in the suburbs of Aleppo, many of them were still under construction as of 2010[update]. As the main economic centre of Syria, Aleppo has a large number of educational institutions. According to the governor of Aleppo Hussein Diyab, there are around 450,000 students attending 913 schools in the city, as of September 2017. 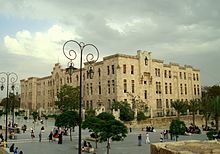 In addition to the University of Aleppo, there are state colleges and private universities which attract large numbers of students from other regions of Syria and the Arab countries. The number of the students in Aleppo University is more than 60,000. The university has 18 faculties and 8 technical colleges in the city of Aleppo. Currently, there are two private universities operating in the city: al-Shahba University (SU) and Mamoun University for Science and Technology (MUST). Branches of the state conservatory and the fine arts school are also operating in the city. 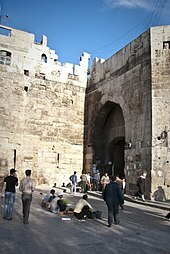 The city of Aleppo is considered an important centre of team sports with football being the most popular in the city. The five major sporting clubs of the city are al-Ittihad SC, al-Hurriya SC, al-Yarmouk SC, Jalaa SC and Ouroube SC. Many Other sport clubs are located in several districts of the city including al-Herafyeen SC, Shorta Aleppo SC, Ommal Aleppo SC, Nayrab SC, al-Shahbaa SC, al-Qala'a SC and Aleppo Railways SC. Basketball is also very popular in the city. All of the 5 Aleppine major sport clubs participate in the men's and women's top division of the Syrian Basketball League, in which both Jalaa SC and Al-Ittihad SC consecutively dominated winning the league from 1956 to 1993. On January 29, 2017, Aleppo hosted the first sports event since 2012, when the local football rivals al-Ittihad SC and al-Hurriya SC played at the Ri'ayet al-Shabab Stadium, within the frames of the 2016–17 Syrian Premier League. ^ Al-Shahbaa (Arabic: الشهباء‎), is an adjective which means "white-colored mixed with black". ^ Almaany Team. "معنى كلمة شَهْباءُ في معجم المعاني الجامع والمعجم الوسيط – معجم عربي عربي – صفحة 1". almaany.com. ^ a b Central Bureau of Statistics (CBS). Aleppo Subdistrict Population Archived 20 May 2012 at the Wayback Machine. ^ a b Gábor Ágoston; Bruce Alan Masters (2010). Encyclopedia of the Ottoman Empire. Infobase Publishing. p. 30. ISBN 978-1-4381-1025-7. ^ "Collections – Aga Khan Collection – Aga Khan Historic Cities Programme – Aleppo Citadel Restoration". Archnet. ^ a b c Jansen, Micheal. "Aleppo rebuilds itself from destruction of war". Irish Times. ^ Al Burai, Ahmed. "Aleppo looks to rebuild after years of war". TRT World. ^ "Aleppo". World Heritage Site. Archived from the original on 4 March 2012. Retrieved 11 March 2012. ^ Dan Ben Amos (2011). Folktales of the Jews, V. 3 (Tales from Arab Lands). Jewish Publication Society. p. 283. ISBN 978-0-8276-0871-9. ^ A.E.J. Morris (2013). History of Urban Form Before the Industrial Revolution. Routledge. p. 1038. ISBN 978-1-317-88513-9. ^ "حلب الشهباء..معناها وأهميتها عند النبي العربي إبراهيم الخليل". hadhramautnews.net (in Arabic). Archived from the original on 6 July 2018. Retrieved 19 January 2019. ^ "Meet some of the world's oldest continually inhabited cities". ^ Alfonso Archi (1945). Orientalia: Vol. 63. Gregorian Biblical BookShop. p. 250. ^ Paolo Matthiae; Licia Romano (2010). 6 ICAANE. Otto Harrassowitz Verlag. p. 482. ISBN 978-3-447-06175-9. ^ Trevor Bryce (2014). Ancient Syria: A Three Thousand Year History. OUP Oxford. p. 111. ISBN 978-0-19-964667-8. ^ Paolo Matthiae; Nicoló Marchetti (31 May 2013). Ebla and its Landscape: Early State Formation in the Ancient Near East. Left Coast Press. p. 250. ISBN 978-1-61132-228-6. ^ Horowitz, Wayne (1998). Mesopotamian Cosmic Geography. Eisenbrauns. p. 82. ISBN 978-0-931464-99-7. ^ a b Cyrus Herzl Gordon; Gary Rendsburg; Nathan H. Winter (1990). Eblaitica: Essays on the Ebla Archives and Eblaite Language, Volume 4. p. 63,64,65,66. ISBN 978-1-57506-060-6. ^ Trevor Bryce (2014). Ancient Syria: A Three Thousand Year History. OUP Oxford. p. 34. ISBN 978-0-19-100293-9. ^ Trevor Bryce (1999). The Kingdom of the Hittites. Oxford University Press. p. 152. ISBN 978-0-19-924010-4. ^ John David Hawkins (2000). Inscriptions of the Iron Age: Part 1. Walter de Gruyter. p. 388. ISBN 978-3-11-080420-1. ^ Trevor Bryce (2014). Ancient Syria: A Three Thousand Year History. OUP Oxford. p. 111. ISBN 978-0-19-100292-2. ^ Guy Bunnens (2006). A New Luwian Stele and the Cult of the Storm-god at Til Barsib-Masuwari. Peeters Publishers. p. 130. ISBN 978-90-429-1817-7. ^ Guy Bunnens (2006). A New Luwian Stele and the Cult of the Storm-god at Til Barsib-Masuwari. p. 130. ISBN 9789042918177. ^ Rieken, Elisabeth; Yakubovich, Ilya (2010). Singer, I. (ed.). "The New Values of Luwian Signs L 319 and L 172". Ipamati kistamati pari tumatimis: Luwian and Hittite Studies presented to J. David Hawkins on the occasion of his 70th birthday. Tel-Aviv: Institute of Archaeology. ^ Trevor Bryce (6 March 2014). Ancient Syria: A Three Thousand Year History. p. 111. ISBN 9780191002922. ^ Ann E. Killebrew (21 April 2013). The Philistines and Other "Sea Peoples" in Text and Archaeology. p. 662. ISBN 9781589837218. ^ a b Lipinsky, Edward, 2000. The Aramaeans: Their Ancient History, Culture, Religion (Peeters), p. 195. ^ a b Healy, Mark (1992). The Ancient Assyrians (Osprey) p. 25. ^ a b Kipfer, Barbara Ann (2000). Encyclopedic Dictionary of Archaeology. p. 626. ^ Jackson, Peter (July 1980). "The Crisis in the Holy Land in 1260". The English Historical Review. 95 (376): 481–513. doi:10.1093/ehr/XCV.CCCLXXVI.481. ^ "Histoire des Croisades", René Grousset, p. 581, ISBN 2-262-02569-X. ^ Kay Kaufman Shelemay (1998). Let jasmine rain down: song and remembrance among Syrian Jews. University of Chicago Press. p. 70. ISBN 978-0-226-75211-2. ^ Battle of [email protected]. ^ "Aleppo in History (in Arabic)". Panoramaline.com. Archived from the original on 15 March 2012. Retrieved 11 March 2012. ^ Masters, Bruce. "The 1850 Events in Aleppo: The Aftershock of Syria's Incorporation into the Capitalist World System." International Journal of Middle East Studies 22, no. 1 (February 1990): 3–4. ^ Eldem, Edhem; Goffman, Daniel; Masters, Bruce (11 November 1999). The Ottoman City between East and West: Aleppo, İzmir, and Istanbul. Cambridge University Press. p. 71. ISBN 978-0-521-64304-7. ^ Robert D. Kaplan (2014). Eastward to Tartary. Knopf Doubleday Publishing Group. p. 149. ISBN 978-0-8041-5347-8. ^ Andrew Mango (2011). Ataturk. p. 55. ^ James F. Goode (2009). Negotiating for the Past: Archaeology, Nationalism, and Diplomacy in the Middle East, 1919–1941. University of Texas Press. p. 64. ISBN 978-0-292-77901-3. ^ Hasan Kösebalaban (2011). Turkish Foreign Policy: Islam, Nationalism, and Globalization. Springer. p. 58. ISBN 978-0-230-11869-0. ^ "ﺣﻠﺐ ﻋﺎﺻﻤﺔ ﺍﻟﺜﻘﺎﻓﺔ ﺍﻟﺈﺳﻠﺎﻣﻴﺔ-Aleppo the Capital of Islamic Culture". Archived from the original on 5 July 2008. Retrieved 2008-07-05. CS1 maint: BOT: original-url status unknown (link). Retrieved 1 February 2010. ^ Martin Chulov in Beirut; Nour Ali (12 August 2011). "Syria violence spreads to commercial capital Aleppo | World news". The Guardian. London. Retrieved 11 March 2012. ^ Bakri, Nada (19 October 2011). "Pro-Assad Rally Shows Syrian Government Can Still Command Support". The New York Times. ^ "Aleppo Mass Rally | DayPress". Dp-news.com. 20 October 2011. Retrieved 11 March 2012. ^ a b Aji, Albert; Keath, Lee (11 February 2012). "Syria says bombers kill 28 in Aleppo". The Herald-Sun. Associated Press. Retrieved 11 February 2012. ^ Staff (10 February 2012). "Syria unrest: Aleppo bomb attacks 'kill 28'". BBC. Retrieved 11 February 2012. ^ "Deadly car bomb hits Alepp". Emirates247.com. 18 March 2012. Retrieved 29 August 2013. ^ The Associated Press (18 March 2012). "CBC news:Blast in Aleppo". Cbc.ca. Retrieved 29 August 2013. ^ Martin Chulov; Luke Harding (29 July 2001). "Syria unrest: Assad forces continue onslaught in Aleppo". The Guardian. London. Retrieved 2 August 2012. ^ Damien Cave (31 July 2012). "Rebels in Syria's Largest City Said to Seize 2 Police Stations". The New York Times. Retrieved 1 August 2012. ^ "Brutal Treatment of Pro-Assad Captives" (Slide show). The New York Times. 1–3 August 2012. Retrieved 3 August 2012. ^ "Fighting in Aleppo starts fire in medieval souqs". Kyivpost.com. Retrieved 29 August 2013. ^ "UNESCO Director-General deplores destruction of ancient Aleppo markets, a World Heritage site". UNESCO World Heritage Centre. Retrieved 29 August 2013. ^ "Syria says Turkey involved in looting northern factories | News, Middle East". The Daily Star. Retrieved 25 March 2013. ^ Sim, David (16 December 2016). "The fall of Aleppo timeline: How Assad captured Syria's biggest city". IB Times. ^ Aron, Lund (15 December 2016). "A Turning Point in Aleppo". Carnegie Middle East Center. Retrieved 16 December 2016. ^ "Syria's long, brutal civil war may be reaching turning point". ^ "Syrian army announces victory in Aleppo in boost for Assad". Reuters. 22 December 2016. ^ "Aleppo evacuation is complete, Red Cross says". Reuters. 22 December 2016. ^ "400 factories return to production in al-Kallaseh industrial zone in Aleppo – Syrian Arab News Agency". sana.sy. Retrieved 5 December 2017. 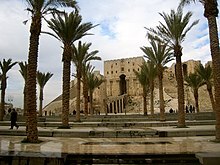 ^ "Syria: Ancient Citadel of Aleppo reopens after liberation of city". RT International. Archived from the original on 3 December 2017. Retrieved 5 December 2017. ^ "'A new horror': 80 children among those slaughtered in suicide attack on refugee convoy". ABC News. 17 April 2017. ^ "Thousands of people participate in Aleppo shopping festival – Syrian Arab News Agency". sana.sy. Retrieved 5 December 2017. ^ "Syrian YPG militia: government has taken control of Aleppo district". Reuters. ^ a b Alexander Russell, ed. (1856). The Natural History of Aleppo (1st ed.). London: Unknown. p. 266. ^ a b "eAleppo:Aleppo city major plans throughout the history" (in Arabic). ^ "Klimatafel von Aleppo (Halab) / Syrien" (PDF). Federal Ministry of Transport and Digital Infrastructure. Retrieved 13 December 2016. ^ "Klimatafel von Aleppo (Halab) / Syrien" (PDF). Federal Ministry of Transport and Digital Infrastructure. Retrieved 26 November 2016. ^ "Aleppo Climate Normals 1961–1990". National Oceanic and Atmospheric Administration. Retrieved 26 April 2017. ^ Yacoub, Khaled (16 July 2010). "Travel Postcard: 48 hours in Aleppo, Syria". Reuters. Retrieved 11 March 2012. ^ "Aleppo". Middleeast.com. Retrieved 11 March 2012. ^ bleeker. "Alepposeife: Aleppo history". Historische-aleppo-seife.de. Retrieved 11 March 2012. ^ "200,000 civilians try to escape violence in Syrian city of Aleppo". ^ Hovannisian, Richard G. (2004). The Armenian People From Ancient to Modern Times, Volume II: Foreign Dominion to Statehood: The Fifteenth Century to the Twentieth Century. New York: Palgrave Macmillan. p. 425. ISBN 978-1-4039-6422-9. ^ "The worst place in the world? Aleppo in ruins after four years of Syria war". theguardian.com. 12 March 2015. Retrieved 22 November 2015. ^ "Catholic Doctor "Flies High" with The Flying Hospital to Treat the Less Fortunate in Aleppo, Syria". Catholicnews.sg. 23 March 2009. Archived from the original on 20 October 2013. Retrieved 29 August 2013. ^ "Christians Hold Out in Syria's Aleppo Despite Jihadist Threat". aina.org. ^ "20 Churches Were Destroyed As Bombings Continue in Aleppo, Syria". Archived from the original on 4 August 2017. Retrieved 3 May 2017. ^ Eyad, Alhosein (22 December 2016). "Christmas In Aleppo: Photos, Video Show Christians Celebrate Assad Victory In Syria". International Business Times. Retrieved 26 December 2016. ^ Profile: Aleppo, Syria's second city. BBC News. 24 July 2012. ^ James A. Paul (1990). Human Rights in Syria. Human Rights Watch. p. 91. ISBN 978-0-929692-69-2. ^ Cyrus Adler; Henrietta Szold (1949). The American Jewish Year Book. American Jewish Committee. p. 441. ^ Avi Beker (1998). Jewish Communities of the World. Lerner Publishing Group. p. 208. ISBN 978-0-8225-9822-0. ^ Friedman, Thomas L. (28 April 1992). "The New York Times:Syria Giving Jews Freedom To Leave". The New York Times. Retrieved 11 March 2012. ^ Solomon, Daniel. "There Are No More Jews in Aleppo". The Forward. Retrieved 14 December 2016. ^ Racy, A.J. (2003). Making Music in the Arab World: The Culture and Artistry of Tarab. Cambridge, UK: Cambridge University Press. p. 248. ISBN 978-0-521-31685-9. ^ Shannon, Johnathan Holt (2006). Among the Jasmine Trees: Music and Modernity in Contemporary Syria. Middletown, CT: Wesleyan University Press. ISBN 978-0-8195-6944-8. 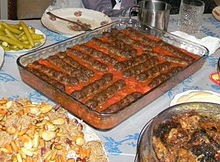 ^ "NPR web: Food Lovers Discover The Joys Of Aleppo". ^ "ﻛﻮﻧﺎ :: ﺍﻟﻤﻄﺒﺦ ﺍﻟﺤﻠﺒﻲ ﻳﻨﻔﺮﺩ ﺑﺘﻨﻮﻉ ﺍﻃﻌﻤﺘﻪ ﻭﻃﻴﺐ ﻧﻜﺘﻪ 11/01/2006". Kuna.net.kw. Retrieved 29 August 2013. ^ Atlioglu, Dr Yasin (30 September 2012). "ORIENT: Aleppo Burns – Dar Zamaria, Sisi House and much of Souq reported Burned- Syria Comment". ORIENT. Retrieved 1 January 2017. ^ "Aleppo new fountains". Archived from the original on 9 October 2017. Retrieved 3 December 2018. ^ "eAleppo: The old Souqs of Aleppo (in Arabic)". Esyria.sy. Retrieved 11 March 2012. ^ "Aleppo ... Cultural Landmark, Trade Hub". DP-news. Xinhua News Agency. 16 April 2011. Retrieved 11 March 2012. ^ "Ministry of Tourism, Syria: Aleppine House (in Arabic)". ^ Burns, Russ (1999). Monuments of Syria. New York, London. p. 35. ^ "Aleppo". Travelnut. 13 December 2011. Archived from the original on 28 July 2011. Retrieved 11 March 2012. ^ Carter, Terry; Dunston, Lara; Humphreys, Andrew (2004). Syria & Lebanon. Lonely Planet. p. 186. ISBN 978-1-86450-333-3. ^ UNESCO. "Ancient Villages of Northern Syria". Retrieved 30 October 2011. ^ "Gold in Syria". 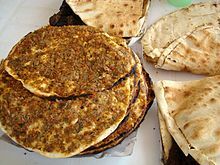 aliqtisadi.com. Retrieved 29 August 2013. ^ "Aleppo gold market". Syria Steps. Retrieved 29 August 2013. ^ "155 billion Syrian Pounds invested in Aleppo Industrial City (in Arabic)". Aksalser.com. Retrieved 11 March 2012. ^ The Report Syria 2011. Oxford Business Group. 2011. p. 195. ISBN 978-1-907065-34-7. ^ "Madinatuna, Aleppo Cite Development Strategy: Informal Settlements". ^ "Stadiums in Syria". World Stadiums. Retrieved 11 March 2012. ^ "eAleppo:Khans in Aleppo". Esyria.sy. Retrieved 11 March 2012. ^ "UDP-Aleppo". UDP-Aleppo. 15 December 2011. Retrieved 11 March 2012. ^ "Gaziantep cultural committee: Gaziantep sister cities, Aleppo-Syria (in Turkish)". Archived from the original on 31 July 2012. ^ "Jamahir newspaper: 28 January 2010 (in Arabic)". Archived from the original on 19 February 2010. 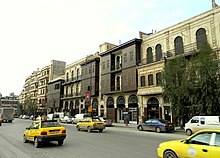 Wikivoyage has a travel guide for Aleppo. 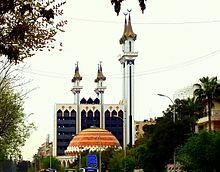 Homs, previously known as Emisa or Emesa, is a city in western Syria and the capital of the Homs Governorate. It is 501 metres (1,644 ft) above sea level and is located 162 kilometres (101 mi) north of Damascus. Located on the Orontes River, Homs is also the central link between the interior cities and the Mediterranean coast. The Umayyad Mosque, also known as the Great Mosque of Damascus, located in the old city of Damascus, is one of the largest and oldest mosques in the world. Aleppo Governorate is one of the fourteen governorates (provinces) of Syria. It is the most populous governorate in Syria with a population of more than 4,868,000, almost 23% of the total population of Syria. 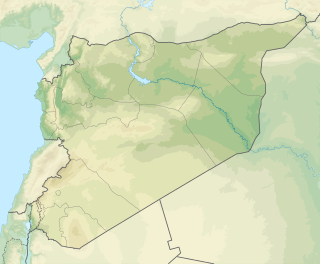 The governorate is the fifth in area with an area of 18,482 km2 (7,136 sq mi), about 10% of the total area of Syria. The capital is the city of Aleppo. The governorate is represented by 52 deputies in the parliament, of whom 20 come from the city of Aleppo. The Citadel of Aleppo is a large medieval fortified palace in the centre of the old city of Aleppo, northern Syria. It is considered to be one of the oldest and largest castles in the world. Usage of the Citadel hill dates back at least to the middle of the 3rd millennium BC. Subsequently, occupied by many civilizations including the Greeks, Byzantines, Ayyubids and Mamluks, the majority of the construction as it stands today is thought to originate from the Ayyubid period. An extensive conservation work took place in the 2000s by the Aga Khan Trust for Culture in collaboration with Aleppo Archeological Society. Dominating the city, the Citadel is part of the Ancient City of Aleppo, a UNESCO World Heritage Site since 1986. The Citadel received significant damage during the Battle of Aleppo. It was reopened to the public in early 2017 with repairs to damaged parts underway. The Citadel of Damascus is a large medieval fortified palace and citadel in Damascus, Syria. It is part of the Ancient City of Damascus, which was listed as a UNESCO World Heritage Site in 1979. 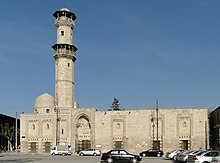 The Great Mosque of Aleppo or the Umayyad Mosque of Aleppo is the largest and one of the oldest mosques in the city of Aleppo, Syria. It is located in al-Jalloum district of the Ancient City of Aleppo, a World Heritage Site, near the entrance to Al-Madina Souq. The mosque is purportedly home to the remains of Zechariah, the father of John the Baptist, both of whom are revered in Islam and Christianity. It was built in the beginning of the 8th century CE. However, the current building dates back to the 11th through 14th centuries. The minaret was built in 1090, and was destroyed during fighting in the Syrian civil war in April 2013. The Ancient City of Damascus is the historic city centre of Damascus, Syria. The old city which is one of the oldest continuously inhabited cities in the world, contains numerous archaeological sites, including some historical churches and mosques. Many cultures have left their mark, especially Hellenistic, Roman, Byzantine and Islamic. In 1979, the historical center of the city, surrounded by walls of Roman era, was declared a World Heritage Site by UNESCO. In June 2013, UNESCO included all Syrian sites on the list of World Heritage in Danger to warn of the risks to which they are exposed because of the Syrian Civil War. 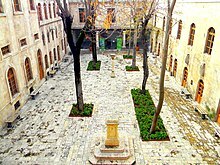 The Forty Martyrs Armenian Cathedral of Aleppo, Syria, is a 15th-century Armenian Apostolic church located in the old Christian quarter of Jdeydeh. It is significant among the Armenian churches for being one of the oldest active churches in the Armenian diaspora and the city of Aleppo. It is a three-nave basilica church with no dome. Its bell tower of 1912, is considered to be one of the unique samples of the baroque architecture in Aleppo. Al-Shibani Church, also known as al-Shibani School, is a 12th-century religious and cultural centre located in "al-Jalloum" district of the Ancient City of Aleppo, Syria. 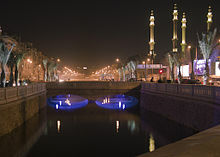 The complex is located to the west of the al-Saffahiyah Mosque and of the south of Suq Khan al-Nahhaseen. The Ancient City of Aleppo is the historic city centre of Aleppo, Syria. Before the Syrian Civil War, many districts of the ancient city remained essentially unchanged since its construction during the 12th to the 16th century. Being subjected to constant invasions and political instability, the inhabitants of the city were forced to build cell-like quarters and districts that were socially and economically independent. Each district was characterized by the religious and ethnic characteristics of its inhabitants. Al-Madina Souq is the covered souq-market located at the heart of the Syrian city of Aleppo within the walled ancient part of the city. With its long and narrow alleys, al-Madina Souq is the largest covered historic market in the world, with an approximate length of 13 kilometers. It is a major trade centre for imported luxury goods, such as raw silk from Iran, spices and dyes from India and many other products. Al-Madina Souq is also home to local products such as wool, agricultural products and soap. Most of the souqs date back to the 14th century and are named after various professions and crafts, hence the wool souq, the copper souq, and so on. 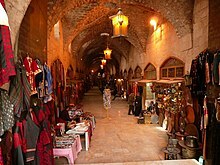 Aside from trading, the souq accommodated the traders and their goods in khans (caravanserais) scattered within the souq. Other types of small market-places were called caeserias (قيساريات). Caeserias are smaller than khans in size and functioned as workshops for craftsmen. Most of the khans took their names after their function and location in the souq, and are characterized by beautiful façades and entrances with fortified wooden doors. 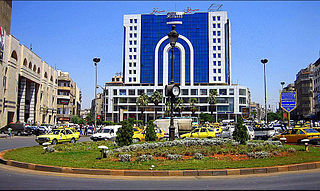 Al-Hatab Square is one of the oldest squares in the Syrian city of Aleppo. 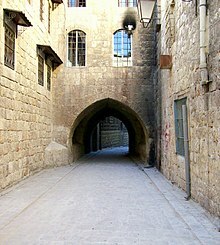 It is located in the old Jdeydeh Quarter, outside the historic walls of the Ancient City of Aleppo. The square suffered catastrophic damage during the Syrian civil war. 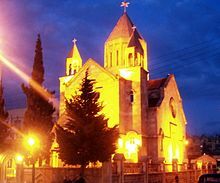 Armenian Diocese of Beroea, is one of the oldest dioceses of the Armenian Apostolic Church outside the historic Armenian territories, covering the Syrian city of Aleppo and the governorates of Deir ez-Zor, Idlib, Latakia and Raqqa. It is known as Beroea, being named after one of the ancient names of Aleppo; when the city was renamed Beroea (Βέροια) in 301 BC by Seleucus Nicator until the Arab conquest of Syria and Aleppo in 637 AD. The seat of the bishop is the Forty Martyrs Cathedral of Aleppo. It is under the jurisdiction of the Holy See of Cilicia of the Armenian Church. 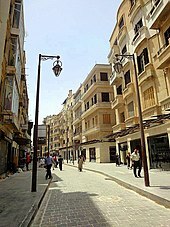 Al-Jdayde is a historic neighbourhood in the Syrian city of Aleppo. It is noted for its winding narrow alleys, richly decorated mansions and churches and has become an area of significant cultural and historical interest. Much of Al-Jdayde suffered catastrophic damage during the Syrian civil war.